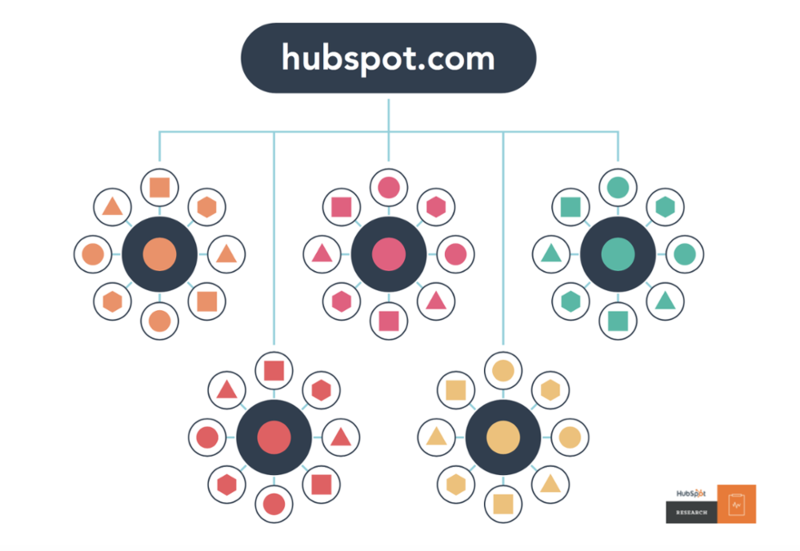 Pillar pages, topic clusters, subtopics: If you’re a HubSpot user or follower of inbound marketing trends, there’s a good chance that you’ve come across the Topic Cluster Methodology while you’ve read about content marketing online or explored the Strategy tool on HubSpot.com. If you’re a marketing agency that uses HubSpot to execute on your clients’ content strategies, you may be wondering about how you can leverage this new methodology to help drive results for the businesses that you serve. Or even if you don’t use HubSpot to service your clients’ marketing efforts, this methodology very much reflects current best practices for SEO and inbound, so it’s critical that all sorts of agencies, HubSpot or not, not only understand how the latest inbound strategy tools can be used to help your clients, but that you are able to lead by example with your own website & content. At Verblio (formerly BlogMutt), we’ve been eagerly learning all that we can about pillar pages and topic clusters, and envisioning how these new methodologies can help the businesses and agencies that use our services. The Topic Cluster Methodology marks an exciting change in the way that content marketing is adapting to changes in SEO. Pillars against a blue sky. In order to execute on this new strategy, it’s essential to reorganize the architecture of your site’s content around pillar pieces and content clusters. Pillar pieces are longer pieces of content that focus on a long-tail keyword. Once these pillars have been established, shorter articles, known as subtopics, are arranged in topic clusters, which link back to the primary pillar page. 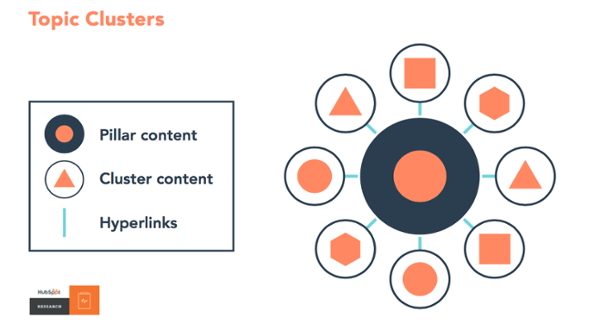 HubSpot recommends creating these topic clusters because “search engines… can easily scan all the content and understand that there is a semantic relationship between the pages’ content”. The Topic Cluster Methodology is also targeted towards human users. Your subtopic pieces will target long-tail keywords that are easier to rank for, so they bring people to your site. Then, your subtopics will all link back to your pillar pages, helping users engage more deeply with your content. This linking strategy will encourage visitors to follow those internal links, which will help you get extra page views and engagement on your site (good for SEO). Additionally, the pillar pages can include CTAs, which will further assist with lead capture. As you can see, the content has been organized around a central pillar piece. Subtopics that are semantically related are linked back to the pillar page. The result? Your content will be easier for your visitors to navigate, and search engines will see that your site is an authority on topics related to your business. 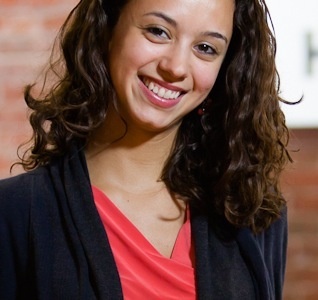 To help educate us on this new HubSpot product and line of SEO theory, we turned to one of the experts: Angela DeFranco, who is the thought leader and product manager who built HubSpot’s Content Strategy Tool, and who is now a manager in their product and engineering divisions. Angela’s background in inbound runs deep. After graduating from Boston University with a degree in Information Systems and Marketing, Angela went on to join the HubSpot team in 2012. Since then, she’s played a pivotal role in their product department—helping HubSpot’s engineers design and execute their newest, most innovative products. When we first met her at Inbound 2017, Angela said that “creating content is the hardest part of inbound”. And that’s really stuck with us. As an agency, you’re undoubtedly familiar with the challenge of creating a steady stream of engaging, rank-boosting content for your clients. With the creation of the Topic Cluster Methodology, HubSpot is making content creation more intuitive for agencies and their clients, and is also helping to drive the most important aspect of inbound marketing: helping businesses find happy, paying clients. During our conversation, Angela and I connected on a video call that bridged Boston to Boulder. As one of the product managers working on HubSpot’s Content Strategy Tool, Angela has a wealth of authoritative knowledge on the connection between quality content and a successful inbound strategy. I asked her to provide me with some insights into how marketing agencies can leverage Topic Cluster Methodology for their clients. What can you tell us about pillar pages, topic clusters, and subtopics? …people were disenfranchised with putting all that work into writing a ton of content that nobody was listening to. And it was cluttering not only their workday, but also their users’ inboxes with emails and content that wasn’t really helping anyone. HubSpot isn’t the only organization that has noticed the overwhelming amount of content online, and how hard it can be to get noticed by search engines. The sheer proliferation of online content has led some leaders in the industry to proclaim that “content marketing is dead”. [HubSpot] started looking around and thinking there’s got to be a better way to attract visitors to your website that doesn’t have to do with bending over backward and breaking a sweat trying to compete with all the media and the noise of the other companies out there who are creating a ton of content. [Once we] isolated the pages that were topically related, and organized subtopic pieces of content around pillars, [we] saw something like an over 13 percent increase in organic traffic. That kind of organic growth is stunning, especially for a content-saturated, high-ranking site like HubSpot. While this visual representation is helpful, we wanted to ask Angela what she thought would be a good way for agencies to onboard their clients using this methodology. If you’re looking to provide similar results for your agency’s clients, where should you start? The baseline of this isn’t all that different from traditional keyword research, where you are trying to figure out what to write about to get you found online so you can start that top of the funnel investment. Let’s say you’re selling hats and you want to be known for blue hats [editor’s note: it was crazy hat day at Verblio on the day of our interview], and you start with ‘blue hats’ as your core topic. You can make some assumptions that because of all the other highly authoritative sites on the internet, you’re probably not going to be known for ‘blue hats’ because you’re a relatively small company. So, let’s try something a little bit more niche, which is essentially a longer tail keyword. So it’s try ‘blue hats in the Boston area for women,’ and then you start to get more focused on what you want to be known for. And, as that happens, you can start developing and put your own expertise into that pillar page and work on it over time. That starts a great foundation: We’re going to start here [with ‘blue hats in the Boston area’] and that we’re going to build this topic up over time to create this nice smooth foundation of traffic growth. By organizing your client’s site architecture and content around answers to common questions, your agency will be able to use the Topic Cluster Methodology to leverage meaningful results. How can agencies encourage their clients to make the switch to pillar pieces and topic clusters? According to Angela, what’s striking is that these pillar pieces and topic clusters aren’t that different from conventional SEO tactics. However, as an agency, you can use the topic cluster model to help strategize your client’s content, and provide them with a broad, clear overview of how inbound marketing is going to help their business. Angela notes that one of the most powerful messages that agencies can send to their clients about topic clusters is that “it’s actually going to get [them] more business”. After all, isn’t finding those happy, paying customers the foundation of inbound marketing? Using topic clusters, rather than keyword ranking tools, clients can track topics by visits, contacts, and customers generated. However, the agency eventually lost their client. Why? “It was because they were focused on something that was so distant from what would actually make [the client] money.” LinkedIn to Snapchat is a pretty big jump to make. What if an agency has expertise in traditional or technical SEO? Do these practices have to take a back seat? If you come from a very technical SEO background you’re going to set up your content clusters, but you’ll also still see how your client’s doing on all of these technical SEO metrics. You can think of the Topic Cluster Methodology as a complement to your current SEO toolkit. As an added advantage, planning out topic clusters and pillar pieces can help you provide your clients with a bird’s eye view for their content strategy, without having to dive into confusing metrics or technical SEO terminology from the get-go. Can agencies lead their clients by example? By taking the time to reorganize the architecture of your agency’s website around the structure of pillars and content clusters, you’ll be able to see how the process works for yourself, and measure the results that you get for your own site. Do it on paper, or do it on a whiteboard if it helps. Audit the things that are specific: dig into the big four things that you want to be known for [these will be your pillars]. Then, push yourself and your team to go a level and a level deeper and then just start seeing what happens. A terrific example of an agency that has led by example is IDS Agency, whose resounding success with topic clusters and pillar pieces led them to be featured as a case study on HubSpot.com. In 2017, IDS Agency decided to overhaul their site’s content strategy and architecture using the new Topic Cluster Methodology. The results? IDS Agency saw an incredible 67% increase in organic traffic to their site. By making the switch to topic-based content, IDS Agency has also been able to speed up the content creation process for both their company’s blog and the content that they’re planning out for their clients. Whether or not your agency follows the gospel of inbound according to HubSpot, you’re surely compelled by the 20% increase in organic traffic that they were able to achieve by utilizing the new Strategy tool and Topic Cluster Methodology themselves. By rethinking traditional SEO tactics and focusing content on the needs of the consumer, this strategy is changing the way that agencies will create organize content for their clients. 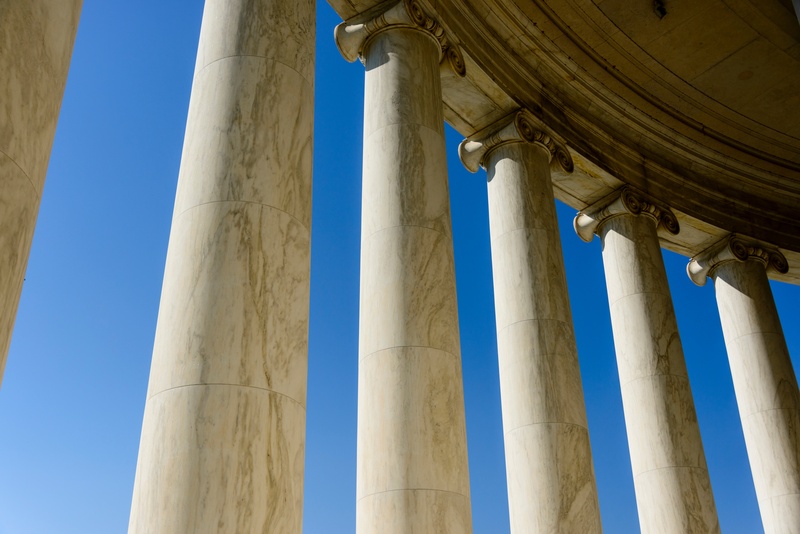 Here at Verblio, we’re ready to help you and your clients execute on your topic clusters and pillar pieces. Whether you’re seeking pillar content to form the backbone of a site, or you’d like to set up recurring topic cluster pieces for your clients, our network of 3,000+ writers is ready to start writing for you. Have questions about topic clusters, pillar pieces, or how to start outsourcing content for your agency? Contact the Verblio team and we’ll be thrilled to assist you. You can also reach out to sales@Verblio.com to learn more about our pricing and subscription services. I do sales and marketing at Verblio, and was previously a content strategist at a digital marketing agency. With over 5 years of SEO and content marketing experience, I'm thrilled to be bringing my expertise to Verblio’s diverse customer base. When I'm not in the office, you can find me painting outdoors, perusing my favorite volumes of poetry, or fawning over other people's mutts. Having recently moved from Hawaii to Colorado, I'm also in the process of trading in my surfboards for ski boots.